Lancaster Hockey Club’s unbeaten home record came to an end with a 5-0 defeat at home to top of the table Pendle Forest 1s on Saturday. Lisa Crewe scored four of the goals while Freya Bythell was also on target as the East Lancashire visitors ran out deserved winners in the North Women’s Hockey League Division Two North West clash. After a promising start Lancaster found themselves 4-0 down at the interval but they kept battling after the break. They couldn’t find a goal despite their best efforts and still sit third in the table having made a good start to the season. The ladies next travel to Preston this weekend. The seconds also tasted defeat, losing 1-0 at home to Lancaster Nomads Ladies 1s in their Lancashire Central Women’s League Premier Division derby clash. The thirds were handed a 5-0 win in Division Two as bottom side Blackpool Ladies 2s conceded their game. 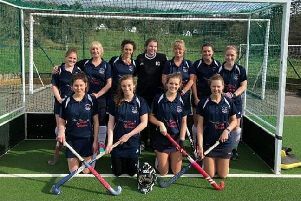 The fourth team went down 2-0 at Longridge Ladies 3s in Division Three. As for near neighbours Lancaster and Morecambe Hockey Club, the men’s first team lost 5-3 to Lindum Mens 1s in the North Men’s League Division One. Two goals from Nick Davey and one from Harry Carpenter turned out to be merely a consolation for the away side as they came away empty handed from their trip to Lincoln. There were better fortunes for the seconds and thirds, the former seeing off Preston Men’s 5s 3-1 in the North West Men’s League Division Five North North while the latter stayed top of Division Six North North with a 3-0 victory over Leyland and Chorley Mens 3s. In the ladies section, the firsts were 1-0 winners against Southport Ladies 1s with players of the match Donna Hurd and Christiane Rogerson starring in the Lancashire Central Women’s League Premier Division clash. The depleted seconds went down in Division One, losing 4-1 to Rossall Ladies 1s despite a valiant display with just 11 players available on the day against a side pushing for top spot. Lancaster and Morecambe actually led 1-0 at the break but the second half saw Rossall take advantage of some tired legs to come away convincing winners. The ladies 3s beat local rivals and bottom of the table Garstang Ladies 4s 3-0 in Division Three. Sabrina Barnes, Lucy Ann and Ruth Benn were on target in the win but it was Sarah Garnett who took the player of the match honours for a fine display.